Winnie was adopted in 2015 after waiting a long time, by Anne and Jeff, and Anne has special things to say about adopting a senior! “After losing my own dog after 16 years in December of 2014 I was apprehensive about adopting. A friend a work sent me a link for senior pet adoptions, scrolling through the pages I saw Winnie’s profile and looked at it for 4 months before I contacted your organization. After a teary phone call with Louise about my trepidation I told her my frequent visits to Winnie’s page. Louise described Winnie as being the “most melancholy dog.” She had been “homed” twice but they had not been successful. Louise offered to show us others but I could not be swayed, after one visit to Ruth’s we went back a few weeks later and brought her home. My husband has never had a pet before but I am guessing that some time in Winnie’s 8-10 years (her age is unknown) she was loved very much by a man because she dances, jumps, shakes all paws (even one of her back legs) and follows Jeff around relentlessly. No door can be shut where he is concerned and she is even known to scratch on the shower enclosure when he’s showering. He owns his own business so sometimes she spends the day with him in the truck too with her own blanket and water dish (and the odd timbit too, I’m guessing). Every day without fail she waits at the patio door for him to come home and a whole production of jumping, running, tricks and treats takes about 20 minutes. It’s hard not to feel a bit snubbed but she loves me as well (just not as vocally!) she is a great snuggler and often curls up in the chair with me when I am reading and when working nights she will often come to bed again after Jeff leaves for work to keep me company curling up with his pyjama pants and pillow. She eats well and has lost some weight with frequent but short walks. When meeting new people she is still a bit shy and will hide behind Jeff until she feels comfortable but has never once growled or nipped. Winnie coming home with us that day made our home and our family complete. We were married this summer and had an outdoor wedding just so she could attend. Our catered lunch even included homemade, iced dog cookies which we a huge hit for her and my son’s dog. It was the perfect day! For anyone who thinks that adopting a senior dog would be a waste I cannot encourage you enough. The love and loyalty are immeasurable. Thank you Louise for the patient and kind words when I was struggling to decide, never knowing if I could love another dog as much as I did my Chloe. I think often of how you said our first dogs leave us a legacy- of learning to love more and over again for all of our pets to come. 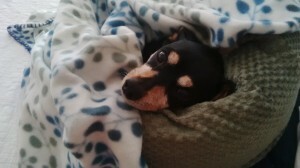 Thank you Minpinerie, I cannot tell you how happy we are with our “melancholy” girl.” So happy this senior found love!! !